Presented as a prelude to Easter, Christ’s Passion enacts a Biblical journey from Creation to Doomsday, including the fall of Lucifer, Garden of Eden, Noah’s flood, and the nativity, crucifixion, and resurrection of Christ. 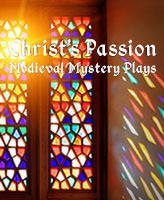 Developed at Notre Dame in 1996, Mark Pilkinton’s adaptation of Christ’s Passion is derived from the English medieval civic religious drama of Chester, N-Town, and Wakefield, as well as the Cornish Cycle, the Quem Quaeritis trope, and an occasional reference to the King James Bible. Pilkinton, who retired from FTT last spring after more than thirty years in the department, first directed and produced Christ’s Passion in Washington Hall with a cast of thirty-eight. This new production, directed by professor Anton Juan, features a cast of twelve actors, all of whom play multiple roles. Influenced by the pageantry of the medieval popular theatre, the production evokes a carnival atmosphere with music and dancing. The set, designed by professor Marcus Stephens, will feature a medieval pageant wagon, a movable stage much like a modern parade float, which will be wheeled into the Philbin Studio Theatre to provide the background for the action. While the medieval spirit will be present, the production is intended to speak to today’s world. The costumes, designed by professor Richard E. Donnelly, draw upon a steampunk aesthetic to create a post-apocalyptic look.